We are always keen to talk to talented people with relevant experience. Give us a call if you would like to be discuss either of these roles. Our business is doing really well and is continuing to grow. ESI is a well regarded, friendly company; we work as a team and value our employees. 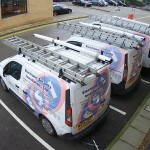 We take pride in looking after our customers and doing a really good job. This means that our customers trust us and come back year after year and therefore 95% of our business comes from recommendations and repeat business. Would you like to be part of our success story? Call us in confidence to find out what it’s like to work at ESI. Experience in the industry is essential for Service & Installation roles. Most importantly we want people who take pride in their work. You must be friendly, understand client confidentiality and have a good work ethic! All staff subject to a BS7858 check including a police check. Full (preferably clean) driving licence please. Excellent Basic + Overtime and on-call allowance (where applicable). Our office is just off the A6 in Whaley Bridge, we cover the North West. Most of our work is around Greater Manchester. Our engineers live around Stockport or Greater Manchester and are not expected to come to the office every day. If you would like to find out more about working for ESI please email in confidence to rob.stoddart@esi.uk.com or call 01663 719520. There’s no obligation – give us a call and talk to us. See if we would be a good fit for you, and visa versa. There’s no harm in asking! Read our customer reviews to get a feel for our work ethic. It goes without saying…..All enquiries are handled in the strictest confidence.